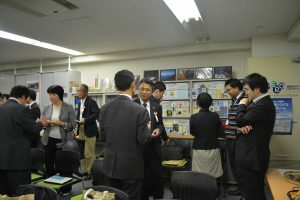 The 3rd Shikoku Environment Partnership Awards, in addition to the ESD Environmental Education Division, established a regional problem-solving idea division and received many entries from civil society organizations, high schools, companies, and others. As a result of the selection by the judging committee, six organizations has won this award. Activity name: “Ohno Bean” resurrection and succession to its next generation through local production of local consumption. Activity name: Placing the thought of the forest on the timbre – Forest and environmental education using Cajon. Activity name: Efforts aiming for a sustainable society in the region. Activity name: Environmental conservation activities in Uwa Sea from the standpoint of ESD. Activity Name: Satouchi Cleanup Forum. Activity name: Public environmental conservation activities. In the “3rd Shikoku Environment Partnership Awards Ceremony” held on March 14 (Wednesday), a letter of credit was handed to each winning organization by Director Ugajin the Takamatsu Office of the Chugoku-Shikoku Regional Environment Office of the Ministry of the Environment. In addition, with the sponsorship of Mitsui Sumitomo Aioi Life Insurance Co., Ltd., co-sponsored since last fiscal year, with the aim of “Let’s support Shikoku’s environmental protection activities in Shikoku through life insurance eco procurement!” with the sponsorship of Shikoku Sales Division according to the number of applications that were received online, we received a donation as a special award to one organization. At the activity presentation by each organization after the award ceremony, examples were shared referring to problems and hints for promoting the initiatives, such as how to involve various subjects and people who are not normally involved, and processes to tackle local problems. Also, although it was a limited time, it became a place to learn from each other and getting new connections among groups and exchanging information. In this recruitment, a lot of efforts were given from the four prefectures of Shikoku. Every effort was wonderful, and it was obvious that the regional environment is supported by the desire and activities that want to improve the living area. We would like to continue supporting the further activities of community organizations, including the Shikoku Environment Partnership Award, as Shikoku EPO, and also to promote learning opportunities.